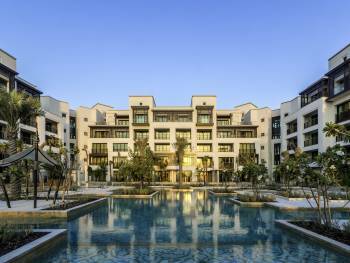 Jumeirah Al Naseem is the newest hotel addition to Madinat Jumeirah at the heart of dynamic Dubai. Nestled on the longest stretch of a sandy beach close to the water, the sound of the sea visits guestrooms and terraces, inviting the outdoors in. The 387 rooms and 43 suites are spacious and open plan. The contemporary interior design is inspired by Dubai’s heritage of pearl diving and Bedouin traditions. From the balconies and extended terraces, there are spectacular views of the sea, the landscaped lush gardens and Burj Al Arab Jumeirah. Guests can visit the turtle lagoon, part of Jumeirah turtle Rehabilitation Project, have fun in the Kids Club, relax in the adults-only pool, venture to nearby Wild Wadi Waterpark™ and experience unique selection of ten restaurants and bars linked by the Arabian Explorer theme; from Rockfish, a vibrant and fun seafood restaurant to The Palmery offering International buffet restaurant.